Spending a day at the beach is the water-related activity most readily associated with this part of our state. Even so, Rhode Island’s coastline wouldn’t be the beloved summer destination that it is if it weren’t teeming with other options for getting out onto the water. Here are some of our favorite ways to get off the sand in South County. There’s a calming allure to paddling in a kayak on a sunny day, and with a setting like the Narrow River running through Narragansett, it’s nearly impossible to step into a kayak and not feel relaxed. Narrow River Kayaks offers paddlers a multitude of daily and multi-day kayak rental options and group outings. Considine and company also understand that continuing to enjoy Narrow River requires a respect for its pristine ecology. This environmental consciousness has motivated the development of Narrow River Kayaks’ eco-tours, led by a master naturalist who expertly caters the tours to all ages. Summer might easily be the best time of year to pick up a new hobby, especially one that gets you out on the water. 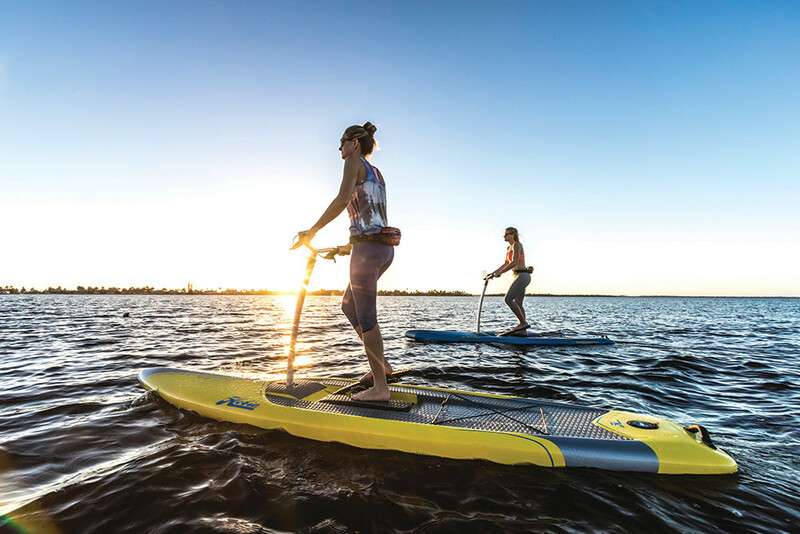 For the folks at The Kayak Centre, the philosophy of teaching their customers a new and exciting passion has guided the integration of stand-up paddleboarding (SUP) into their business. Sometimes you need to dial it up a notch. Enter the jet ski: a machine perfect for devil-may-care adrenaline seekers and water enthusiasts alike. Tucked on a side street by Misquamicut State Beach lies The Purple Ape, a one-stop water sport shop. Purple Ape patrons can rent by the half hour or by the hour, and hour-long renters have the option of cruising around Winnapaug Pond or on the open ocean. Although the kick of a jet ski might seem nerve-wracking, Jasulavic is dedicated to ensuring that his riders feel safe and comfortable. Talk to Peter Pan, local surf instructor and Rhode Island surfing legend, and he’ll convince you there’s no need to leave the state for world-class surfing. “This is the best surfing in the world, as far as I’m concerned,” says Pan – pretty high praise from a guy who has caught waves everywhere from the Jersey shore to Queensland, Australia. Pan shares his passion for big waves with anyone willing to hop on a board through his Peter Pan Surfing and SUP Academy in Narragansett. Water enthusiasts looking to learn how to hang ten can choose from a range of opportunities, from private and group lessons to several-day surfing camps. And when Pan says they cater to everybody, he means it – he’s taught surfers as young as four and surfers in their seventies. His academy is based out of Narragansett Surf & Skate Shop, where more experienced surfers can rent boards and gear and head out on their own.